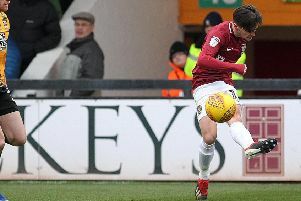 Skipper Marc Richards believes the Cobblers’ new-found attacking flexibility is going to be a headache for opposition defences in the new Sky Bet League One season. The 35-year-old admits that at times last season Town became ‘predictable’ in their attacking play, with first Rob Page and then Justin Edinburgh hamstrung by the lack of forward options at their disposal. Richards and Alex Revell were the go-to men throughout the campaign, and although the likes of loan forwards Keshi Anderson and Michael Smith added something a little different in the second half of the season, Town often lacked an attacking spark. This season Richards and Revell are still at the club, but now they have an abundance of attacking players to help them out or even replace them when needed, with the likes of Billy Waters, Dean Bowditch, Chris Long, Leon Lobjoit and Daniel Powell all able to play in attacking positions. Sam Hoskins is also on the way back from his long-term knee injury, and it means that Edinburgh is going to be able to mix things up before and during games if a goal is needed. And Richards believes that is crucial. “We have a lot of options in attack which is exactly what we need,” said the former Chesterfield man. “You can’t just go big man and a little man, sometimes it might be two little men, sometimes three little men and sometimes three big men, you have to be able to change it up. “You can’t become predictable, and I think in a lot of games last season we were predictable. “When Revs got injured (he was out with an ankle injury from January to April), the pressure was left to myself and at times it was like banging your head against a brick wall, because we didn’t have that strength in depth to change a game or turn something round. And it’s not just in attack where there is that all important competition for places, it is throughout the squad. There are at least two players battling it out for a first team spot in every outfield position, and Richards believes that can only be a good thing. “There is competition for places throughout the team, but that needs to be there,” he said. “If I didn’t have Alex Revell, or Sam Hoskins, or Leon Lobjoit there breathing down my neck then people can get complacent, and positions be taken for granted. Another bonus to having so many players with so many different attributes is that the Cobblers are going to be able to switch systems as well as personnel. Edinburgh has stated his preferred option is to play with a back three, and that is how the team has shaped up in pre-season, but he also knows he has the back up that if that system doesn’t work, he can now try something else. And Richards believes the team’s ability to be unpredictable is going to be a big asset as they battle to succeed in league one in the months ahead. “The squad needs to be flexible,” he said. “We can’t go into a season and just play 4-4-2, or 4-4-1-1, we need to be flexible in finding ways to beat teams. “We are going to come up against some massive clubs in the league this season, Blackburn Rovers being one of them, and I have absolutely no doubt they will have a lot of possession this season with the players they have got in their squad. “So we have to go to those sort places and work out how we can get a point, or how we can nick three points. “That means we need to work on formations, and what better way to work on formations than in pre-season.